When you are in the first year leading a program and your team is this bad, the rebuilding process can’t begin until the present tense of inferior ability has been addressed. 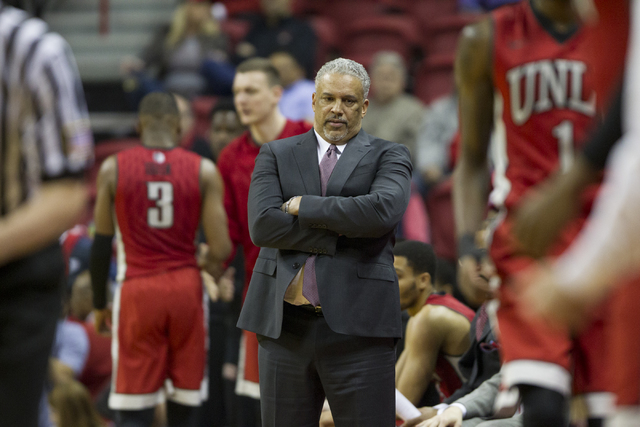 Marvin Menzies was a beaten man beyond just a scoreboard Saturday, the raw honesty of his emotional words rightly painting a picture of UNLV basketball in its current grim and unforgiving state. It’s a cruel but common part of the business, and you only get one opportunity to sweep the broom so thoroughly. Cleaning house can’t become a yearly ritual. You can’t be known as That Guy beyond one terrible season. At this point, results are secondary for the Rebels, and that includes a 94-58 defeat to UNR before an announced gathering of 14,808 at the Thomas & Mack Center, the ninth straight loss for UNLV and record 19th on the season. You can’t be any more blunt than that. Major changes are coming, and that shouldn’t surprise anyone who has watched UNLV. There is one way of thinking that as losses piled up and it became obvious the Rebels were in for a record year in terms of futility, Menzies should have given more playing time to scholarship freshmen Ben Coupet Jr., Zion Morgan and, before he went down to injury, Troy Baxter Jr. over seniors that will have no effect on coming seasons. Now, that’s not to say in their time on the floor, any of those first-year players were impressive to the point that not playing them seemed outrageous. I’m not certain, but Baxter might average 10 shots every 30 seconds. But if Menzies is going to recruit over many of his young players — something that must be done for UNLV to move forward — a larger sample size of their skill in actual games might have been beneficial to the process. Christian Jones and Uche Ofoegbu and Tyrell Green might give you the best chance to win now, but this was a lost season from the outset and the three seniors aren’t going to be around to determine the program’s future. Recruiting will dictate how large the renovation becomes for a UNLV team that has one signee and one oral commitment thus far for next season. When hired in April, Menzies signed bodies to fill out uniforms and field a team. Now, he needs to sign more legitimate ones to build a program, as many as he can before deciding which current names have a place. It can be brutal. I would think freshman Cheickna Dembele and juniors Jovan Mooring and Kris Clyburn are in those plans. Jordan Johnson, sitting out a transfer year from Milwaukee, will have one season remaining to fill the point guard spot. I have no idea about anyone else. How could you? Some will survive — you still need enough bodies to practice — but to believe many others will play a major role, or any for that matter, isn’t realistic for a side that is 10-19 overall and last at 3-13 in a terrible Mountain West. Coaches handle these things different ways, but there is almost always a discussion about how, while the program will most often renew a player’s scholarship if he has taken care of business in the classroom and been a model citizen and given maximum effort in practice and games, there is also a great chance he would never play another second for the team. In other words, you make it easy for the kid to decide his fate and move on. It was always part of the deal. Had he owned more leverage, Menzies should have demanded a six-year contract, with the first season being completely on the shoulders of an administration that so blatantly screwed up the entire process, and then the next five being on him. He didn’t, but he knows where the journey must next take him: Recruit as many good players as possible and then deal with the current roster. You only get to swing the broom in this manner once and, as difficult as it can be for all involved, it’s a needed act when rebuilding what is now a historically awful UNLV team.